It’s the age old debate, the tried and true question that nearly everyone considers at some point in their life: should I get glasses or contacts? There are advantages to both, and everyone seems to gravitate towards one preference or another eventually, but there are still plenty of us who are hemming and hawing over what the best option for corrective lenses is. Our optometrists Dr. Lang and Dr. Cottone are here to help you decide whether glasses or contacts will be a good fit for you. Learn more, and give us a call to get your eye appointment scheduled with Bayside Eye Center! You should probably consider getting contacts. Jobs in the science, engineering, and construction industries (to name a few) are all ones where you need to protect your eyes on the regular. People can absolutely wear glasses and protective goggles or other forms of eyewear, but for many, it’s an issue of comfort. Considering it would be significantly more dangerous to forego wearing corrective lenses altogether, your best bet might be getting contact lenses. That way you never have to worry about forgetting your glasses, dealing with discomfort, or compromising your safety on the job. Glasses might be your best option. Contacts don’t really take up a lot of time, but they do take more time than throwing on a pair of glasses (though we recommend against throwing your favorite pair). If you like to spend as little time as possible getting ready for the day, glasses are probably a safer bet. Plus, you won’t have to worry about ordering contacts, which is another time-consuming measure that your low-maintenance self will appreciate getting to avoid. Go with contacts! Our staff at Bayside Eye Center will help you get started. Set up an appointment with our staff to see if contacts could still work. Nearly always, people get so used to their contacts that they don’t think twice about putting them in or taking them out — even if they initially had some hesitation or fear about wearing contacts. The Bayside team are pros when it comes to helping people get accustomed to contacts, and if you’re really interested in making the switch from glasses, you’ll probably be just fine in overcoming any initial anxiety. Glasses will be perfect for you. Contrary to what any childhood teasing about being a “four-eyes” might have indicated, glasses are stylish. They give such an air of sophistication and intellect, and at Bayside Eye Center, we have so many incredible styles for you to choose from. It’s fun and exciting to think about what your new look is going to be, and our glasses selection is a great place to start! This can be a bit tricky. If you only need glasses for reading, we’d recommend getting a pair of reading glasses and sticking with that. 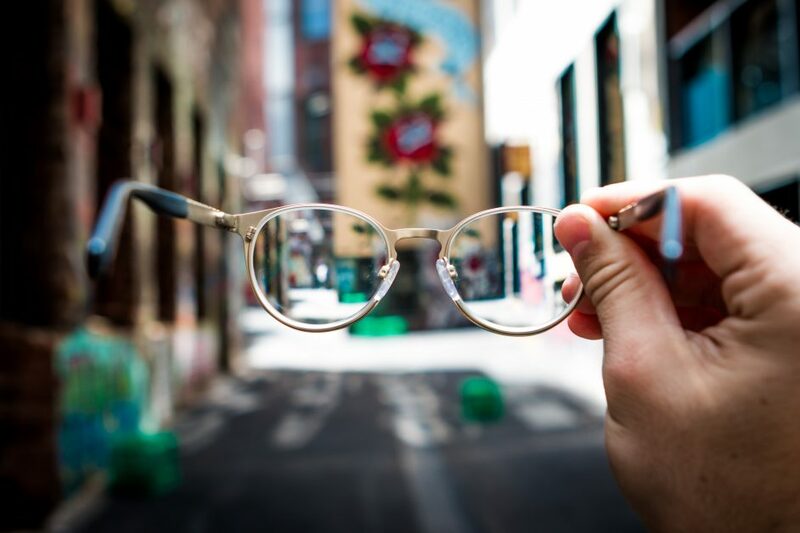 If you’re slightly nearsighted, but need just a little bit of help with correcting your vision every now and then (and not on a near-constant level), glasses also might be a good way to go. Check with our optometrists to see what they recommend for your prescription. Both contacts and glasses have plenty of advantages and benefits, and ultimately, it just depends on what best fits your style and what you’re most comfortable. We like to break down some of the pros and cons to each type of corrective lenses, because many times, people avoid one style because they think it won’t work. We hear a lot of “Oh, I could never touch my eye to put contacts in!” or “I don’t look good in glasses” and we’re here to dispel that kind of thinking. You can go with glasses or contacts and rock them both, and our optometrists are more than happy to help. Set up your next appointment today with Bayside Eye Center in Punta Gorda, and get the best in eye exams, ongoing care, emergency services, and more.